Southwest Solutions is recognized as a leader in providing quality and affordable apartments and townhouses for rent. Our units offer many amenities for residents to feel at home. Apartments are located in a diverse neighborhood with a thriving business district, good schools and educational programs, parks and recreational activities, and a vibrant arts and cultural environment. We encourage neighborhood involvement among our residents. We provide opportunities for all residents to work together to improve the quality of life in the community. Our management team is experienced and bilingual, and is committed to resident satisfaction. Our dedication to providing quality affordable housing dates back to 1979. Southwest Solutions has renovated 20 apartment buildings in southwest Detroit. These are beautiful buildings that have been restored using state-of-the-art construction methods and materials, while at the same time retaining their historic character. Units feature modern kitchens and appliances, quality fixtures, central air and heating, generous natural light, and appealing floor plans. The buildings are energy efficient. Southwest Detroit is recognized as one of the most walkable, diverse and creative neighborhoods in the city. It is a dynamic and convenient place to live that is helping to lead Detroit’s resurgence. Cabot Apartments, 1930 Cabot St.
Carson Apartments, 2439 Carson St.
Claradale Apartments, 2316 Lawndale St.
Clark Apartments, 1185 Clark St.
Cole Apartments, 3615 W. Vernor Hwy. Ferndale Apartments, 8729 W. Vernor Hwy. Galston Apartments, 6442 Michigan Ave.
Grand Apartments, 545 W. Grand Blvd. Harrington Apartments, 465 W. Grand Blvd. Harwill Manor Apartments, 1453 Hubbard St.
Lawndale Apartments, 2201 Lawndale St.
Martin Gardens Apartments, 1755 25th St.
Melie Apartments, 2134 Hubbard St.
Pitt-Carson Apartments, 2506 Carson St.
Savannah Apartments, 250 W. Grand Blvd. Shirley Apartments, 2435 Woodmere St.
Vernor Apartments, 2310 Cabot St.
Whitdel Apartments, 1250 Hubbard St.
Wilshire Apartments, 388 W. Grand Blvd. To see what apartments are available, click here or the Rentlinx logo below. 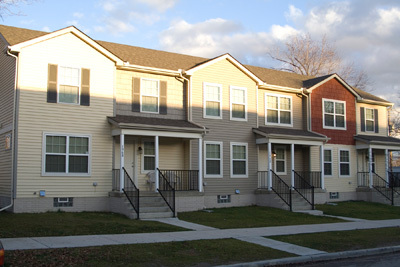 Our townhouse developments consist of single-family, two-story homes for rent in the Mexicantown area. The homes are comfortable, full of amenities, energy-efficient, and specially designed to provide an “at home” experience. They blend into the neighborhood and are helping to revitalize residential streets. Hubbard Communities features 33 new townhouses and 11 new single-family homes. McKinstry Place, our newest development, features 14 new townhouses and 11 new single-family homes. Scotten Park consists of 32 newly constructed townhouses. The Vernor Townhouses feature eight beautifully renovated units located at 3524 W. Vernor Highway. See a map of all the apartment buildings we manage. Southwest Solutions is recognized as one of top 50 developers of affordable housing in the nation. We are the largest multifamily developer in southwest Detroit. The offices of Southwest Housing Solutions are at 1920 25th St., Detroit MI 48216. Call us at 313.841.3727. Or email us at tlopez@swsol.org. Email is the best way to contact us about our units for rent.